Politicians’ use of Twitter has been making headlines recently. 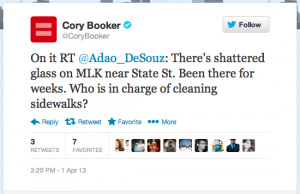 Both Reuters and The Atlantic published articles about Newark, NJ mayor Cory Booker’s impressive Twitter presence (Booker has over one million followers). Closer to home (for me at least), The Coast’s Tim Bousquet published a piece in March about Halifax city councilors’ largely underwhelming Twitter habits. From city politicians to state or provincial leaders, all the way up to presidents and prime ministers, Twitter has become nearly as commonplace in politics as an email address. Individual politicians use these Twitter accounts to varying degrees, some choosing to update accounts personally and often, others choosing to have staffers and interns create the bulk (if not all) of their posts, and some hardly ever using it. No matter how they choose to use the service, a Twitter reputation is being attached to their names. Part of the reason for politicians to be on Twitter, of course, is because it can be so useful in connecting with constituents. Conversations can happen in real time, and people can get in touch with their local representatives with a degree of brevity that’s not typically associated with the thought of contacting the government. 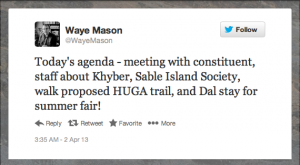 On the flip side, Twitter can also be used to update constituents on one’s schedule, as Halifax councilor Waye Mason does each morning, or on city projects, roadwork, and other issues affecting them. Another benefit of social media for politicians is the opportunity to “let people in” and exhibit a degree of humanity and personality. With personal Twitter accounts, elected officials can not only make official statements or connect with community members about concerns and issues, but can also garner favour and goodwill simply through allowing people to see glimpses of who they are as a person. From a post about lunch at a local restaurant to a snapshot of a child’s dance recital, opportunities abound to introduce oneself to the public not just as a mouthpiece for official policies and party lines, but as a fellow community member and neighbor. Of course, not all politicians have quite grasped these concepts yet. Many have Twitter accounts that they rarely, if ever, use, and some have yet to even create an account. It should be noted that the latter is the wiser choice; better to be completely absent from a service than to publicly demonstrate a poor understanding of how it works and a lack of interest in using it well. The classic line, “better to keep silent and appear a fool than to open one’s mouth and dispel all doubt,” certainly applies here! It’s interesting to note the differences in Twitter representation between Barack Obama and Stephen Harper, (positional) equals in the political world. US President Barack and First Lady Michelle Obama each maintain Twitter accounts in addition to the official White House account. Though their tweets are composed by staffers more often than not, they both post frequently themselves, signing their personal tweets –BO and –MO respectively. The subject matter of their tweets runs the gamut from official statements to candid photos to jokes and recipes from the White House kitchen. 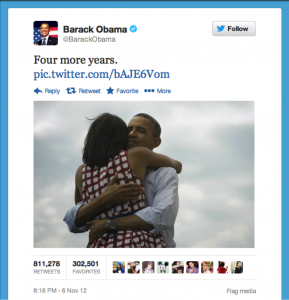 The day of Obama’s reelection in November 2012, an image of the newly reelected President and the First Lady hugging with the simple statement “Four more years.” quickly became the most retweeted post of all time. At the time of this writing, it has been retweeted more than 800,000 times. By contrast, Prime Minister Stephen Harper’s Twitter account is markedly stiff and official. With no evidence that any of the tweets are composed by Mr. Harper himself, it gives the air of being nothing more than another official communication channel for the Prime Minister’s Office. 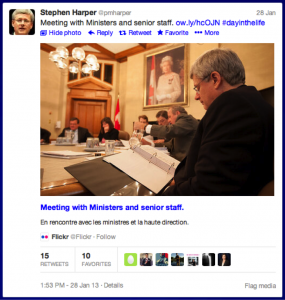 Even when an attempt was made at personalizing Harper’s account by producing a #dayinthelife series, the tweets were still overly formal, the photos obviously professional. It gave the impression of a historian giving an official account of the Prime Minister’s day, as opposed to Mr. Harper himself letting us into his world. It was an unfortunate case study in missing the point. Politicians will continue to use Twitter with varying degrees of effectiveness, of course. That said, those that do have accounts would do well to consider how, and how well, they can be using it. It can be an incredibly effective tool when used properly, and completely useless (sometimes even detrimental) when not.